Last night I played my first round singles tennis playoff match. I’m still not sure why I was in the tournament draw; I didn’t sign up for it. My goal with singles tennis the past few seasons has been straightforward: complete the season without injury with a win-loss record that keeps me at my level. Why such humble goals? Well, I enjoy playing tennis, and a couple of years ago I started getting knee injuries that kept me from completing the season. Some of the injuries were caused by tennis, others from backpacking. In both cases the root cause was the natural decline that occurs with age. You’re a step (or two) out of position when hitting the tennis ball. Hiking on uneven ground with weak legs and core causes other parts of your body to compensate and muscles start giving out after eight miles or so like a row of dominos falling. Visits to doctors resulted in MRIs and painkiller prescriptions. Since the MRIs thankfully revealed that nothing was torn, I resolved that I would do something to offset the atrophy. I selfishly wanted to continue my recreational pursuits with some degree of competence and free of pain. I signed up with a gym and worked with various trainers. Lunges and hacksquats were a big part of my focus. But the problems with the gym were several. 1) At best, I went only three times/week; 2) trainers at these facilities come and go, it’s almost impossible to establish a productive relationship; 3) I learned little about the approach to conditioning and I did very liittle cardio. I made no concessions or changes to my diet. I did improve from going to the gym. My leg and core strength did increase and my knees were more stable. It took about one year for the pain in my right knee to be completely eliminated when playing tennis and backpacking. This, for me, was real proof that there were positive benefits to the effort, such as it was. As with many others, however, I plateaued and started going to the gym more sporadically and, frankly, was bored with it. So I found myself in a place where I was once again playing tennis without pain but now I was losing matches because I was getting tired in the second set, slowing down and not getting to the ball. My whole game is to run everything down and make my opponent want to kill himself out of frustration. Suddenly, I was the old guy who was getting rope-a-doped into a stupor. Something had to change. But I hate running and, in my opinion, cycling here in Atlanta likely reduces your chance of living because there are no shoulders on the roads. Business traveling, staying up late in my hotel room, flipping channels, I’ve watched the P90X commercials many times. It had been in the back of my mind for some time. It came to the front of my mind as a potential remedy for my issues. I started my 90 days on January 23, 2011 and am now almost complete with this round. Aside: it’s interesting how my entire focus has been on how will I get through 90 days. Then, at some point, I start referring to this as my “first round.” Anyway, my aerobic capacity is great right now, which brings me back to yesterday’s tennis match. My last few opponents have commented after the match with statements like: “How old are you?” “Man, you run everything down.” and “Are you a runner? Are you working out?” I’m not making this up. 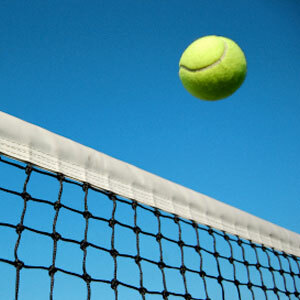 Yesterday, I won my match 6-2, 6-2. In the first four games of the first set I lost one point. In the very first point I jumped and switched from a forehand to backhand stance and almost fell over because I jumped higher than I intended to. I chuckled to myself that my Plyometrically-enhanced fast twitch muscles almost knocked me over. I was dictating. After the fourth game, the sun set and dusk set in. Suddenly, I couldn’t see the ball and was playing defense the rest of the match. As a result, the points got longer. But I was frustrating my opponent. I know this because he smashed and broke his racket after I gave him a drop shot in the second set. I hadn’t intended to bring much effort to yesterday’s match, but it was beautiful outside and I was feeling good. It’s great to play a match and feel like you can still play a couple of more sets. I was happy to close the book with my final chapter of the evil Ab Ripper X routine. But I know in my gut (as it were), I will still need to do it with some ongoing consistency because I know how quickly I regress after just one Recovery Week off. This entry was posted in P90X, Round 1 and tagged Ab Ripper X, Milestones, P90X, Pain, Plyometrics, Pull Ups, Tennis. Bookmark the permalink.